This will be my last 2014 South Korea trip post. Like finally. 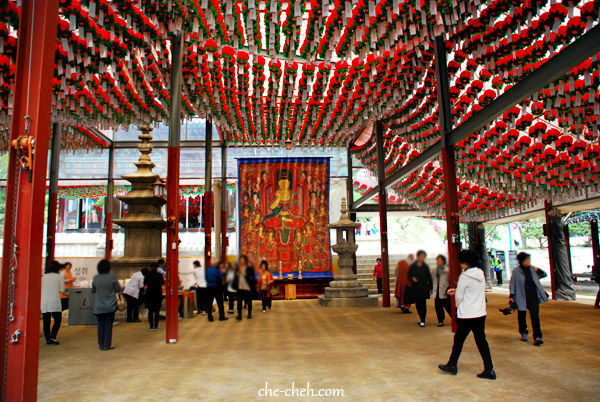 We visited Bongeunsa Temple 봉은사 on the morning of day 13. 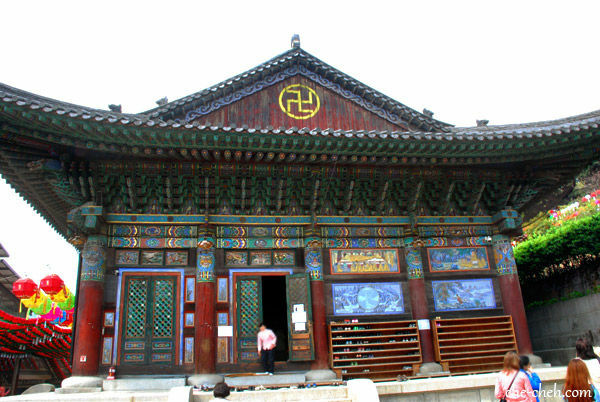 My main reason for visiting this Buddhist temple is because it was the filming location for my favorite Korean drama, Faith. The bonus? This temple is huge and so beautiful. 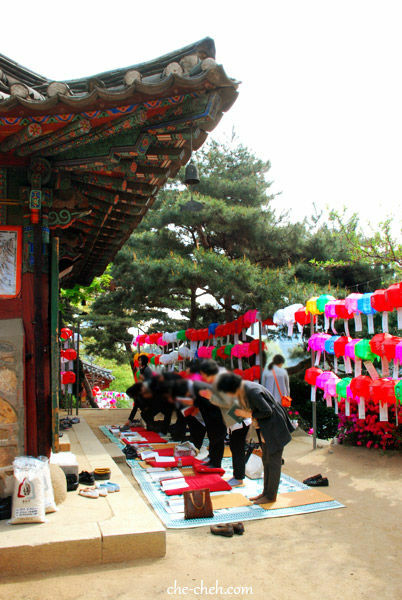 It has existed since 794 although it first started with a different name (Gyeonseongsa Temple) and location (1km away). 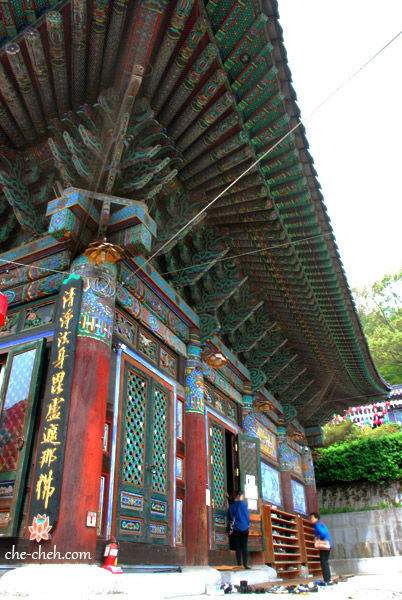 The main gate to Bongeunsa Temple. 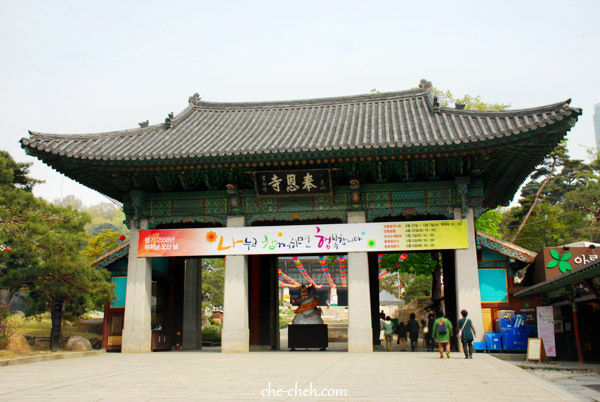 Faith: It’s also here we saw Choi Young crosses the street to COEX from this temple gate when he first arrived in the modern world. 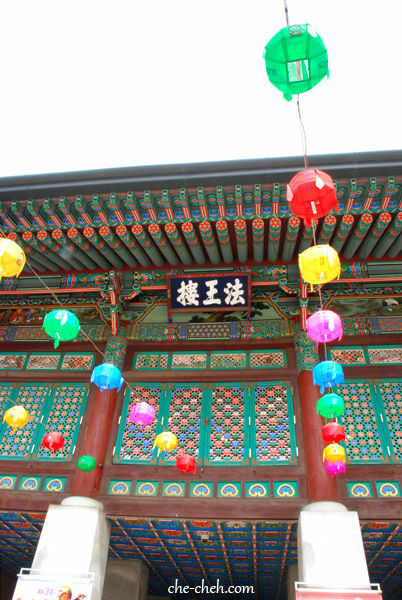 Beautiful lanterns decorate the temple front. These lanterns which you will see a lot in my photos are not for decorations. 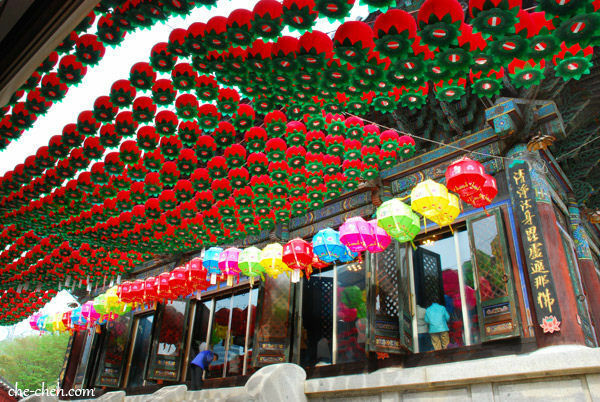 They are prayer’s lanterns by devotees. Side view of the Main Buddha Hall. Main Buddha Hall. It’s one of the most beautiful temple architecture I’ve ever seen. Beautiful view of devotees and lanterns. 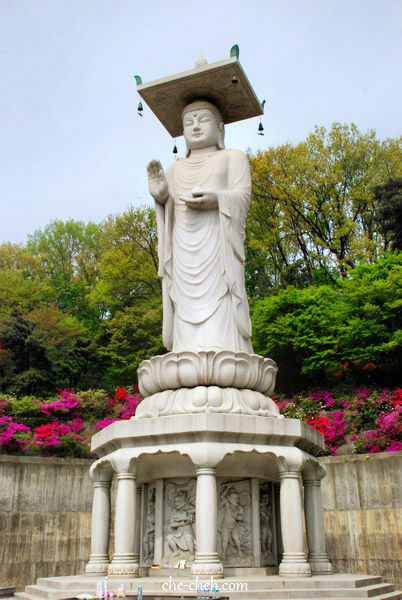 Great Statue of Maitreya Buddha. So beautiful! Faith: The location of the wormhole. 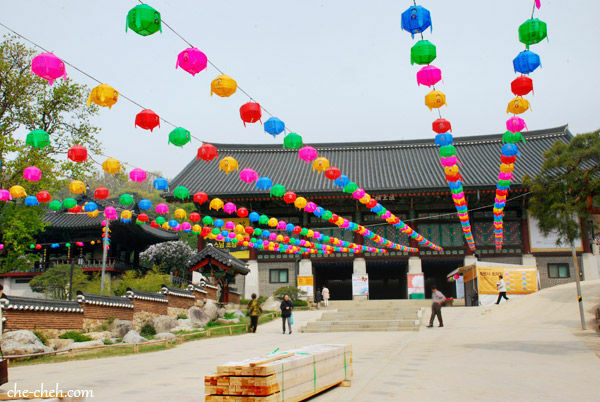 The place where Choi Young brought Eun Soo back to his world and where Eun Soo came back to the modern world trying to save Choi Young back in Goryeo (yeah I know complicated). This old man is hanging our lantern and message for Buddha’s blessing. 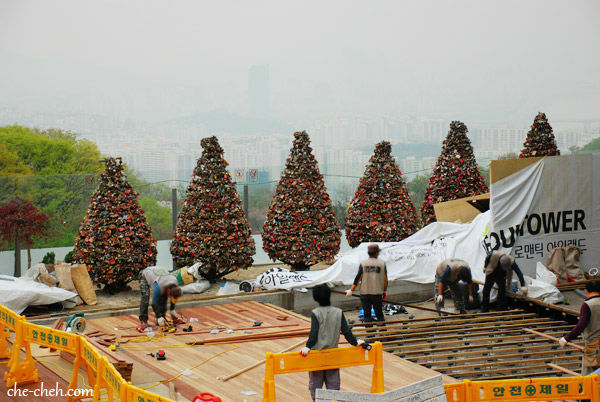 Cost 50,000 won. 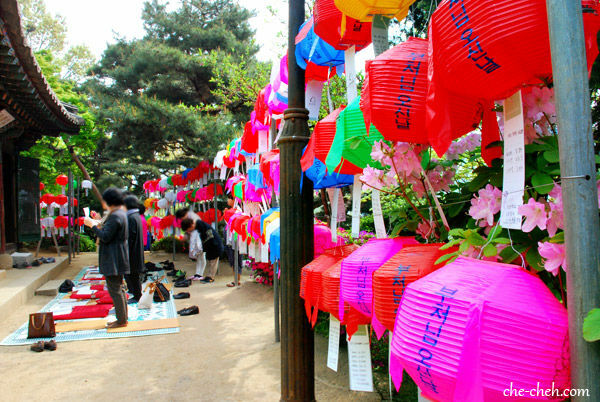 I actually wanted those colorful lantern but couldn’t break the Korean language barrier with the workers there. Haha Never mind, this is good too. 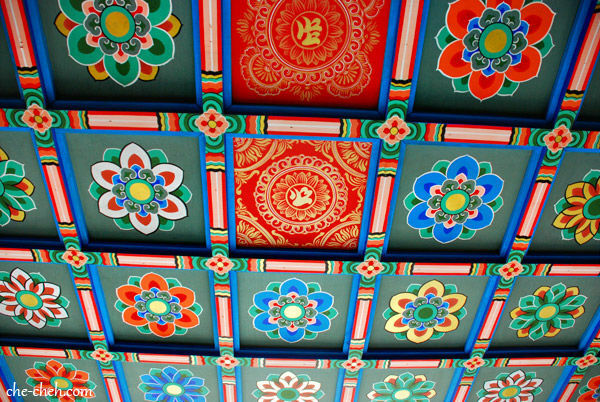 Ceiling of the temple. So pretty ya? Love this temple. I might try their Temple Stay program in the future. 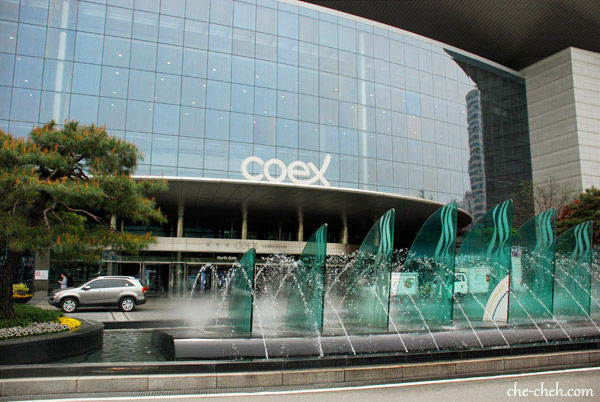 Across the street from Bongeunsa Temple is Coex which is short for COnvention centers and EXhibition halls. It also has a mall. 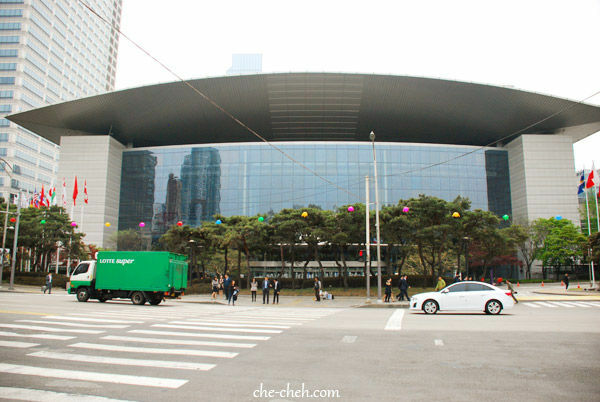 Faith: Yes, Choi Young came to Coex where he met Eun Soo for the very first time. It was surreal when I went into Coex because I’ve seen the Faith scene so many times. 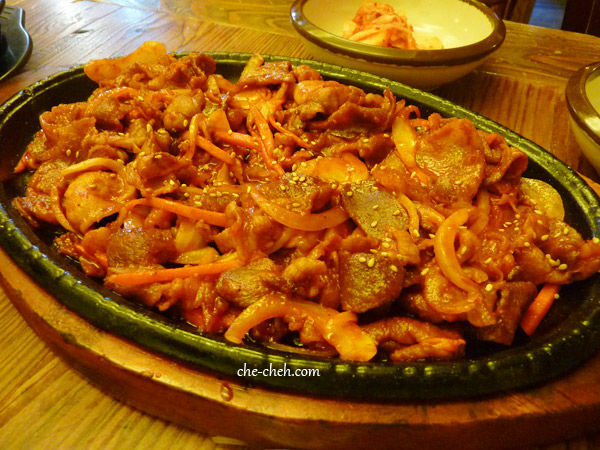 Haha We had lunch of bossam (boiled pork belly) at Banhaneun Bossam & Bapsang inside Coex Mall. Read my delicious lunch review here. 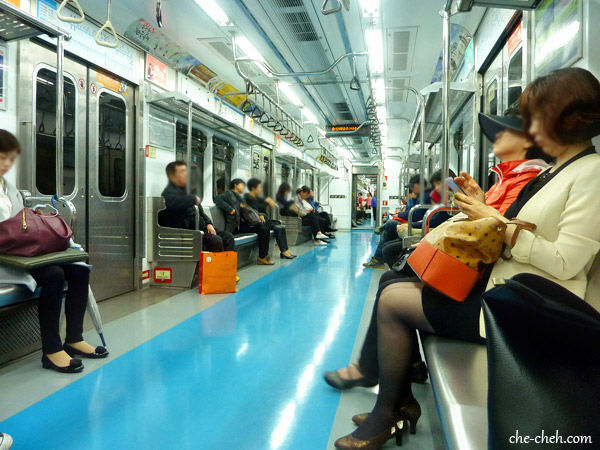 Took subway to our next location. I love how spacey these subway trains are. But of course when it comes to rush hour, you wish you’re somewhere else! 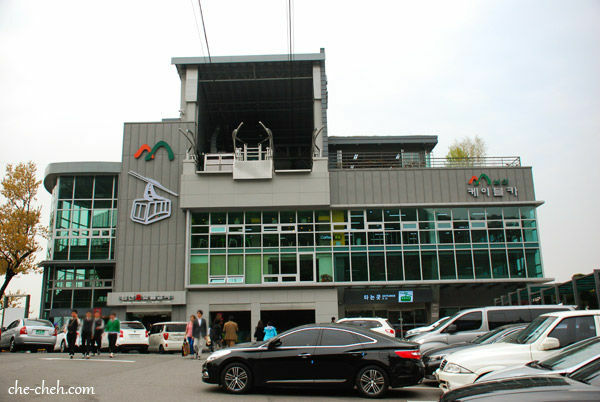 Our next destination is the Namsan Cable Car and N Seoul Tower which you can see on the far left of this photo. 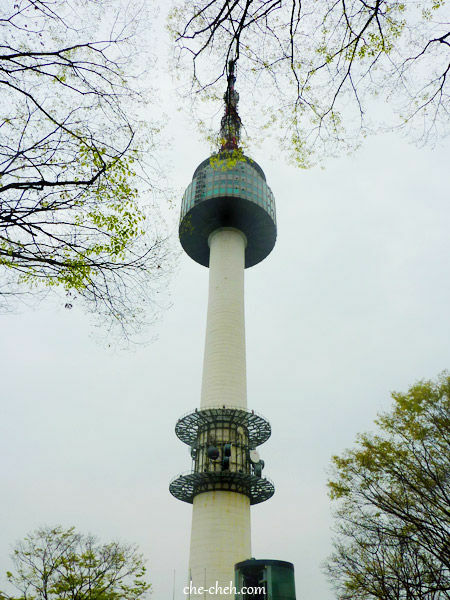 I’ve visited N Seoul Tower 11 years ago by couch and even went up to the tower. 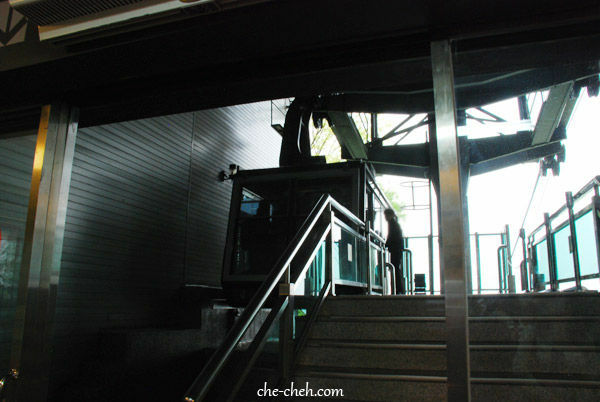 This time I’m just going to hang out at the base of the tower and at the same time try the cable car. We walked here from Myeondong subway station. 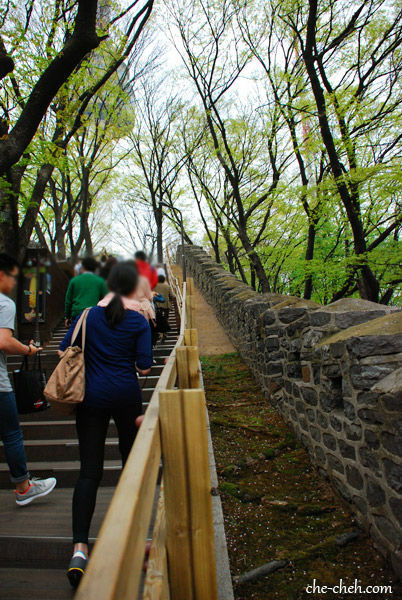 After arriving by cable car, you need to walk up some stairs. 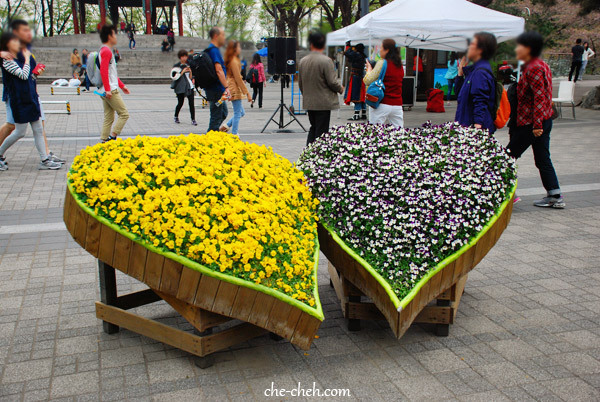 Love flowers. I love it! 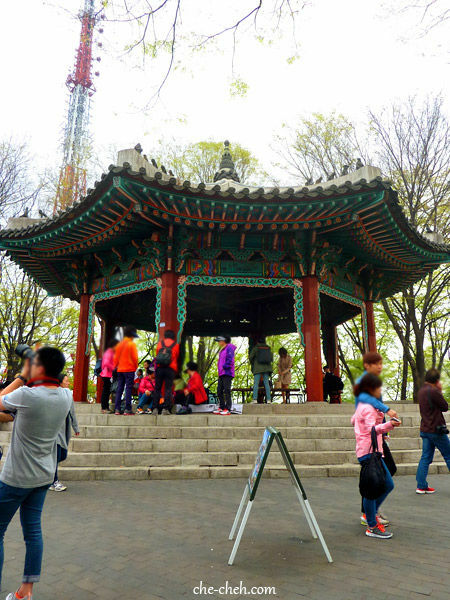 A beautiful pavilion at the base of N Seoul Tower. 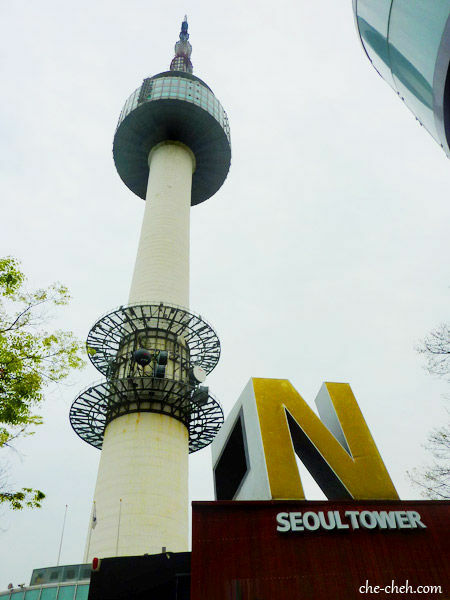 When I visited many years back, N Seoul Tower is known as its old name, Namsan Tower (it means South Mountain Tower). 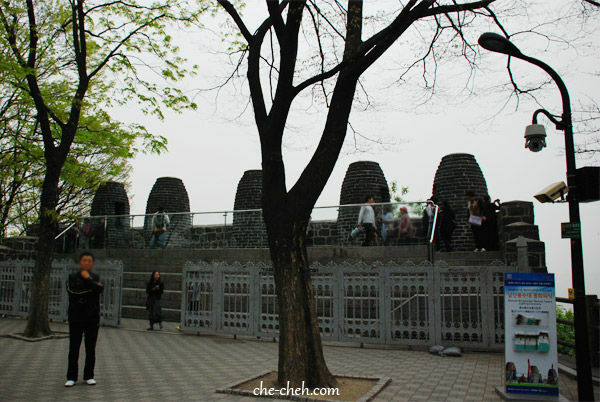 If you don’t know, this tower appear in many Korean dramas. Of course the one I remembered most is Boys Over Flowers where Jun Pyo waited for Jan Di at the base of the tower. 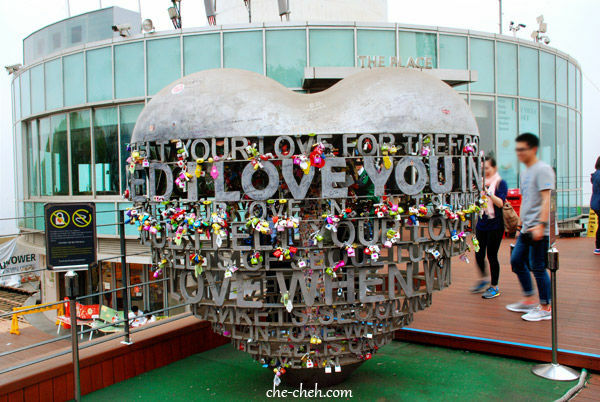 My main aim coming to N Seoul Tower are these love locks. It’s located at roof terrace 2nd floor and is free. I know there are love locks all over the world, especially Paris and Rome which I visited two years ago but couldn’t find time to have a look. 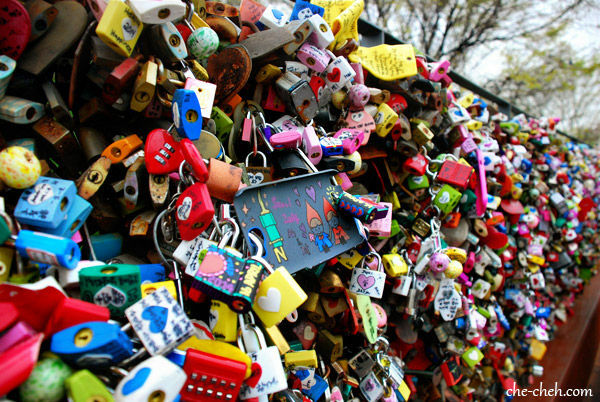 I’ve seen locks at Great Wall of China though. 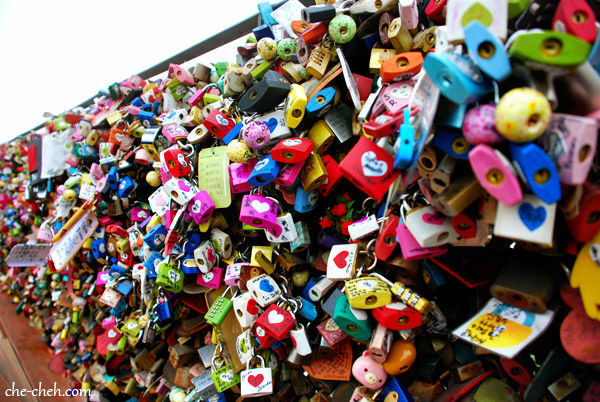 You’re not suppose to put locks at this love figure but as you can see nobody follow the rules. Love is blind! So did I bring a lock? 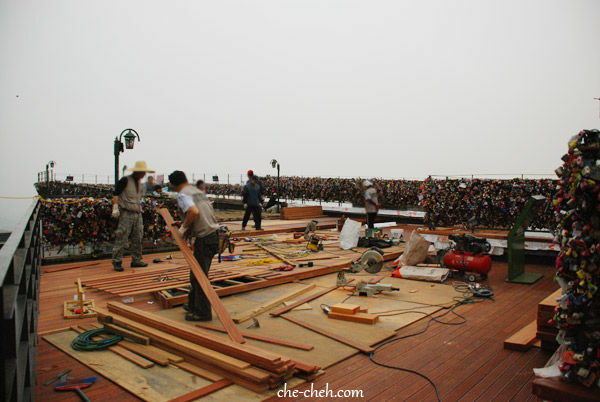 There are actually more areas with love locks but as you can see they are undergoing renovation. This area too is undergoing renovation. These are called love chairs. They have been moved here because of the renovation you see at the photos above. Why call love chairs? When two people sit at both side, they will slide and meet at the middle! 🙂 I find these chairs/benches really cute. Me at N Seoul Tower! Waiting for our cable car. I bet this photo will remind Boys Over Flowers fans of that particular date night between Jun Pyo and Jan Di. Because Myeondong is very near to Namdaemun, we walked to Shinsegae department store (Namdaemun branch) to fulfill my/our next wish. 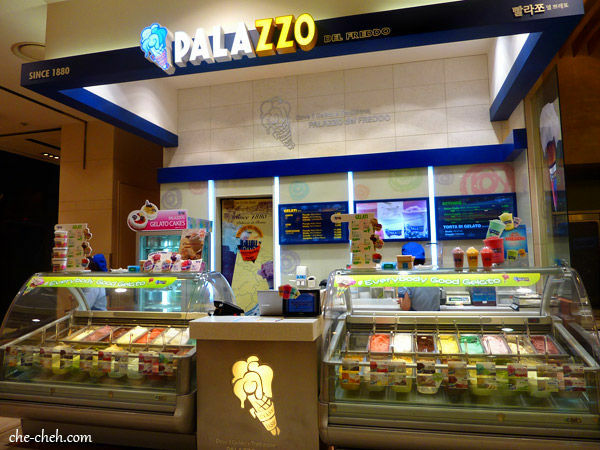 Two years back I had the best gelato in Rome at a shop called Palazzo del Freddo Giovanni Fassi. I knew they have shops in Shanghai and Seoul. Although I wasn’t able to make my dream come true in Shanghai, I was able to make it happen in Seoul. 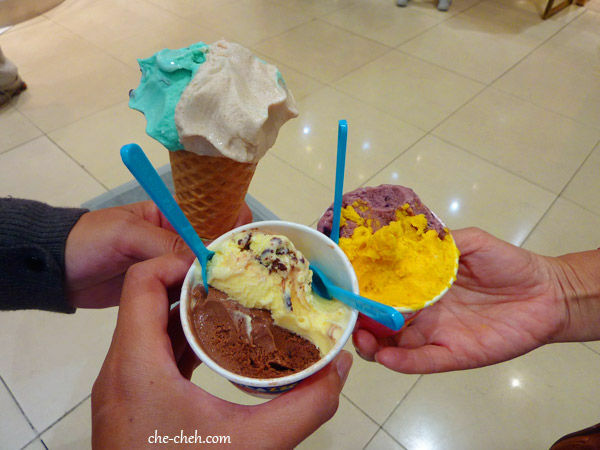 These cost us 13,500 won (RM40.50). Definitely not cheap in Seoul. 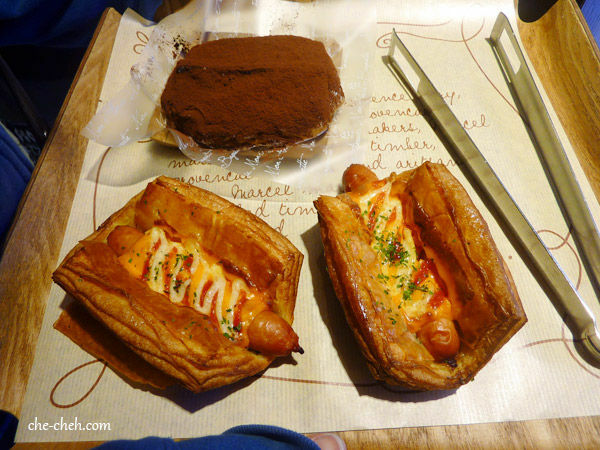 As for the taste, it’s yummy but just not on par with the one in Rome. 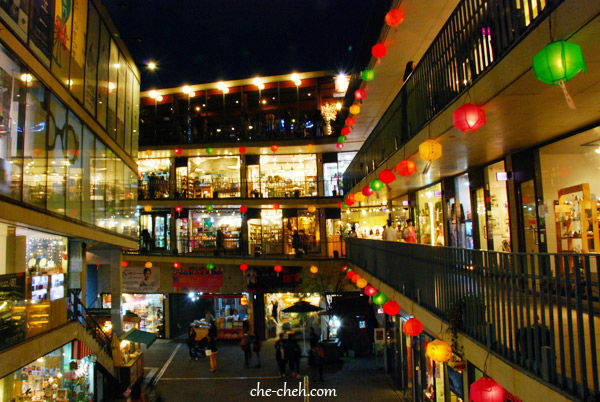 Then we walked back to Myeongdong, did some shopping there again. 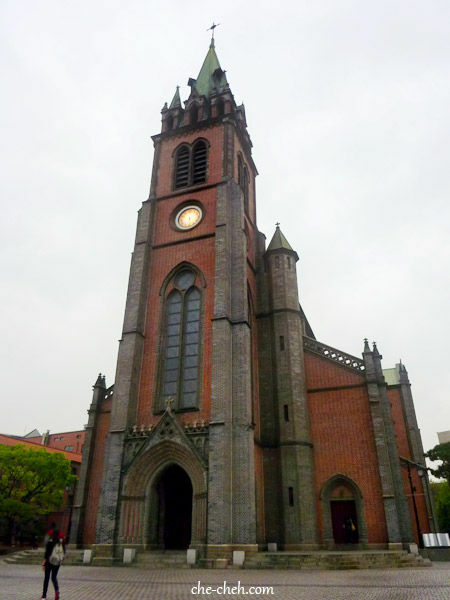 We also stopped by O’Sulloc Myeongdong branch for some tea and dessert shopping and then visited this Myeondong Cathedral. Nice ya? It then starts to drizzle. 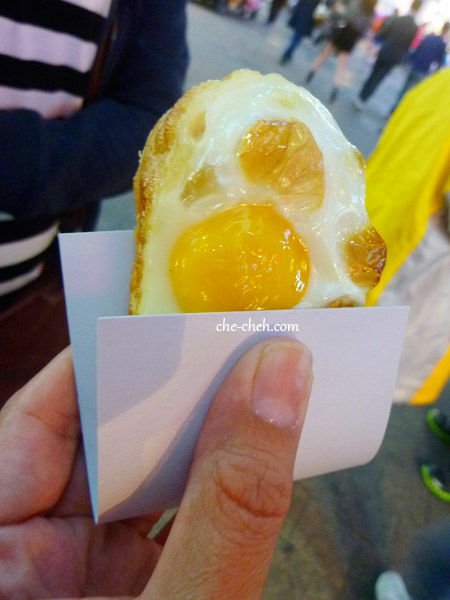 Yet, I still managed to stop by this gyeranppang stall (egg bread). Bought one to try @ 1,500 won (RM4.50). Not bad but my own gyeranppang is nicer. Hahaha Recipe here if you’re interested. Finally it starts to pour and we decided to takeaway KFC and ran all the way back to Myeondong subway station and then all the way back to hostel. 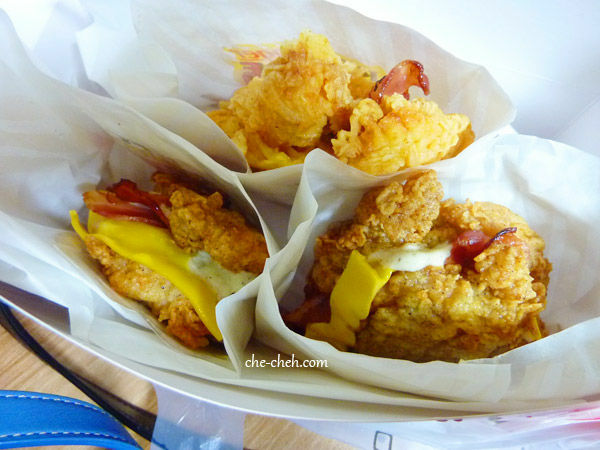 This is KFC double down: bacon between two chicken fillets. It taste so horrid. So so so so so salty. Yuck! Didn’t finish it. 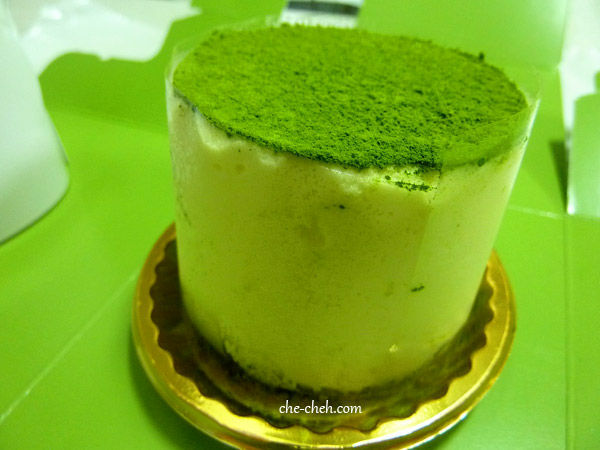 We packed this O’Sulloc green tea cake and tried it at the hostel. It was yummy! 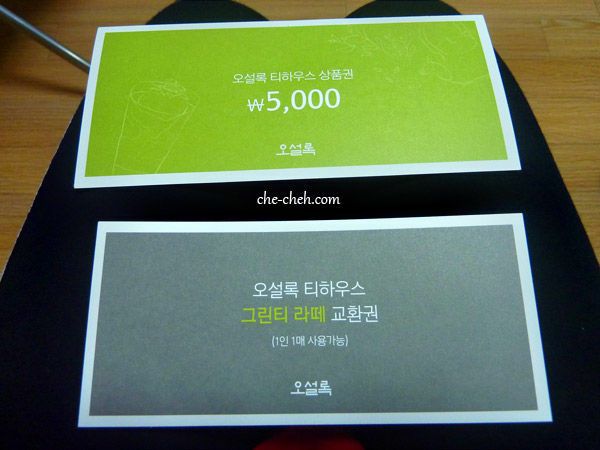 We even received these vouchers from O’Sulloc: a 5,000 won off voucher and a free green tea latte. Wow! That sum up my day 13. As I did not do much photographing on day 14 and 15, I decided to combine the last two days here as well. 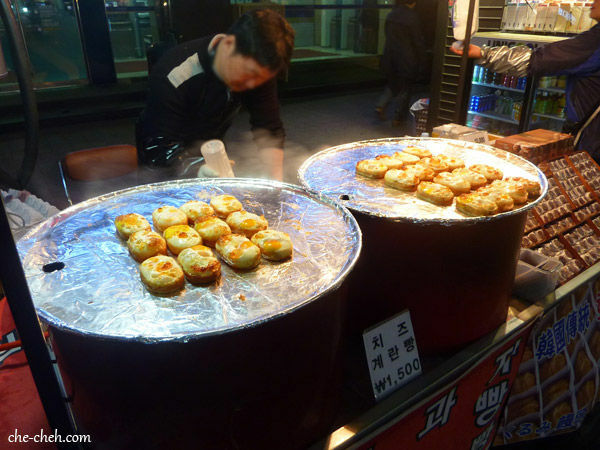 After that we went back to Jilsiru again (we first visited on day 10) to buy tteok (rice cakes) and cookies before going back to hostel to rest. At night we came out for dinner in Insadong at a restaurant called Joheun Ssiat. It was another yummy dinner but I didn’t review about it though as I feel this type of restaurant cater more to tourist. After dinner we visited Ssamziegil again. Previously we have visited during day time. Did ya realized how we keep going back to the same place we have visited? LOL. 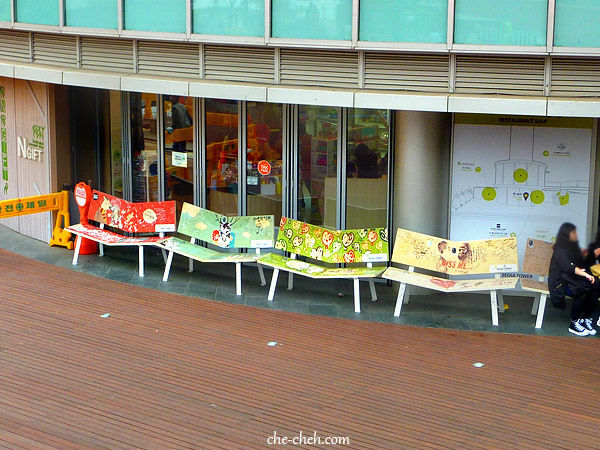 Our final stop for day 14 is O’Sulloc Tea House at Insadong (actually just opposite Ssamziegil). Remember we received two O’Sulloc vouchers the previous day? See this O’Sulloc post on what we had there. 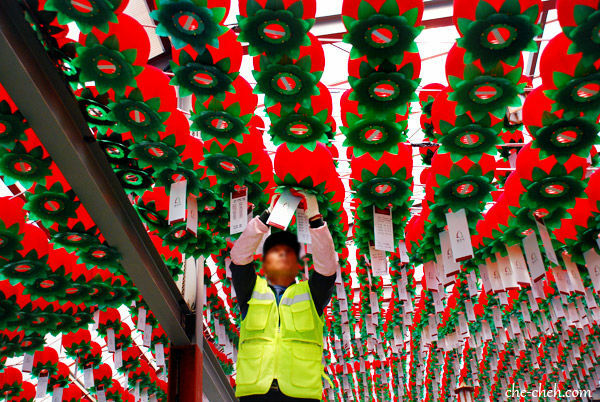 Day 15 is the day we bade goodbye to South Korea. I wished we had stayed longer. Hahaha We woke up at 4am!!! Walked to airport bus stop at 5.50am wanting to catch the 6.08am bus. 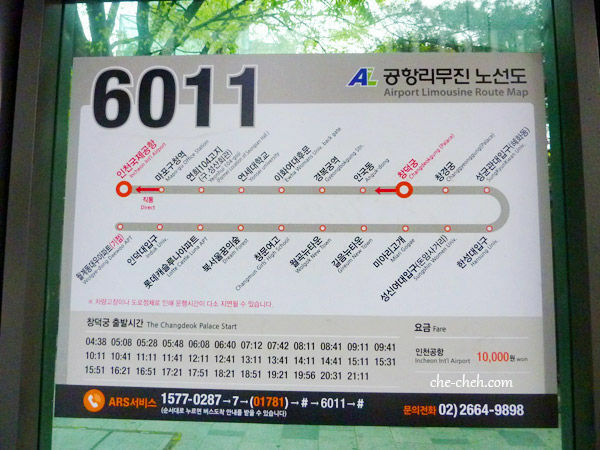 One thing good about staying at Stay In GAM is how near it is to the airport bus stop (Changdeokgung stop)… about 5 minutes I would say. 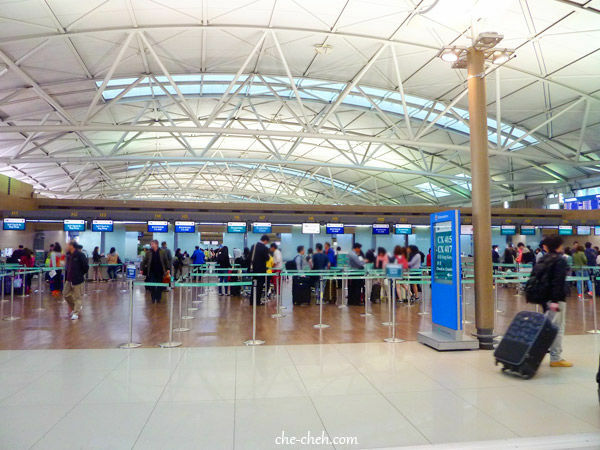 The bus arrived late (6.18am) and took over an hour to reach Incheon Airport. 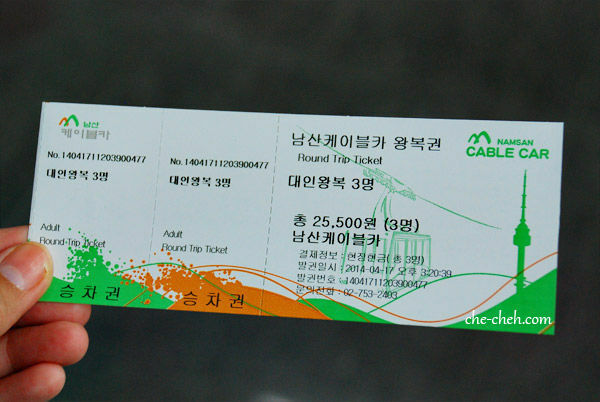 The bus fare is 10,000 won but we only paid 9,000 won due to the discount voucher we received from Stay In GAM. Our flight was 11am and I always take the effort to arrive as early as I can. Some bread from Paris Baguette for breakfast at Incheon Airport. MAS check in counter. While queuing up here, we checked out others people luggage because some brought many boxes on their trolley. I wonder what they are. KPC lo. Reached Malaysia nearly 5pm and couldn’t be happier to see my homeland again. That’s it from my 2014 South Korea trip. Weheeeeeee! 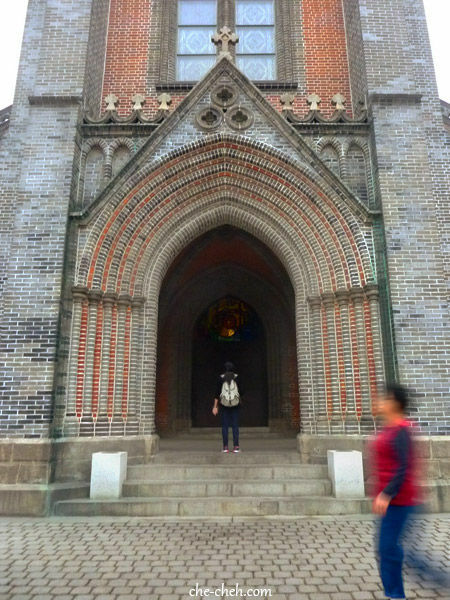 I started this travelogue with pleasant and some unpleasant memory (felt like I was visiting China due to being spoken in Mandarin so many times in Seoul). And I could gladly say the unpleasant memory are now far away from my mind. I only have good memory to bring forward. 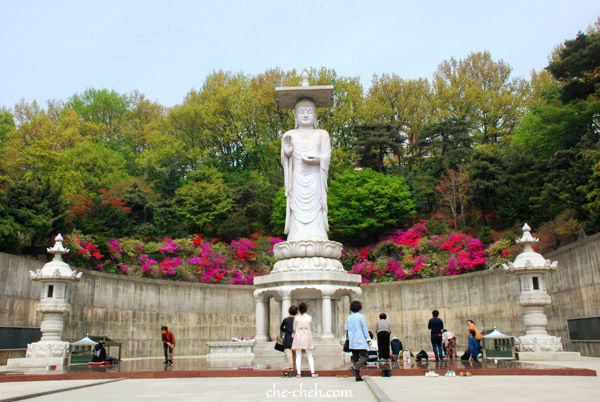 I have many more places I wanted to visit in South Korea… ah the abundance of beauty and food… so you bet I will go back there again in the future. I hope by then I’m more well-verse in 한국어 Korean language. I spent 6.5k for this whole 15D/15N South Korea trip (airfare, accommodation, food, transport, attractions & shopping – everything). It’s a little cheaper compared to my 2010 Australia trip if you count it following the same amount of day. But still expensive according to my standard. I thought I would only need about RM5k. Accommodation and airfare are the main factors. Visited South Korea from the southern island of Jeju to the capital city of South Korea in the north, Seoul, changed accommodation 4 times, rode on train, bus, taxi, subway, plane plus plenty of walking, saw so many beautiful scenery and architecture, spoke to many friendly people of the Han, enjoyed my shopping and ate so many yummy Korean food, this trip has been a blessing. Hi Benny, Singapore has KFC Double Down? Oh yeah utter nonsense. 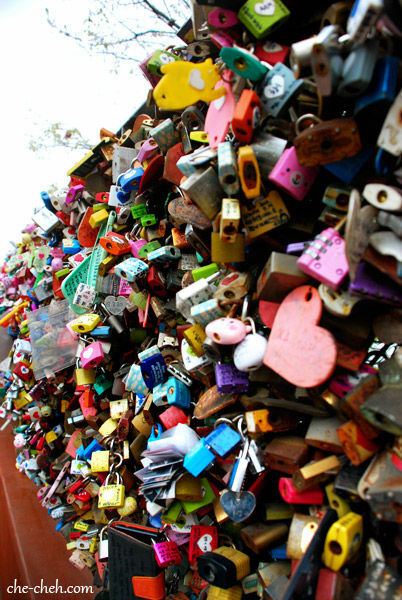 Yup those love locks are lovely. Yes, we have this double down nonsense last time. Terrible. What a beautiful temple! 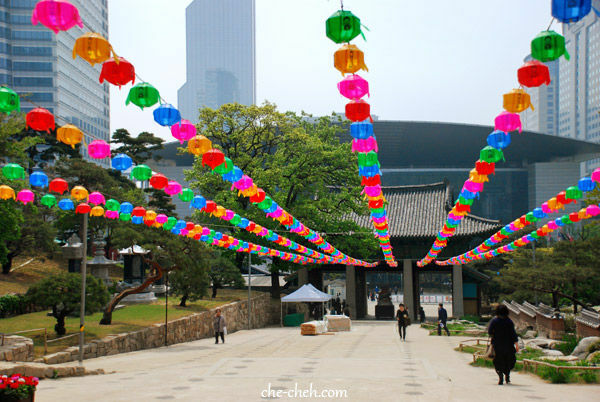 Lovely lanterns! I wonder where they buy those cute locks. Oh! SO funny those love chairs!! Haha! 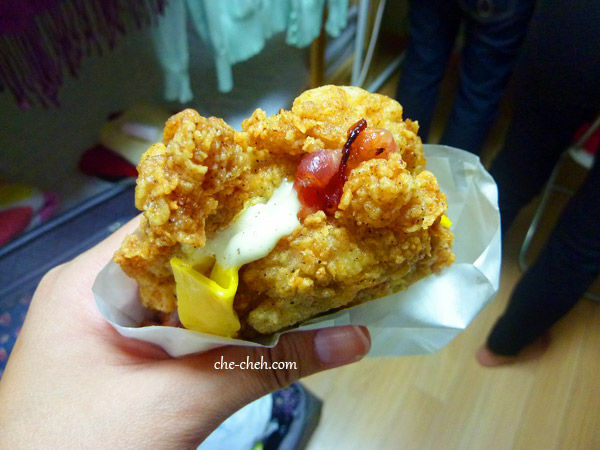 KFC Double Down? Never taste before! So it’s horrid? You threw them away? Ate about 3/4 then threw it away. Beh tahan already. Oh yeah finally. Not sure yet. It will probably be next year. Ohh Korean instant noodles but eh nowadays Korean instant noodles are widely available locally. Maybe they’re not from the city. Hahaha thank you. 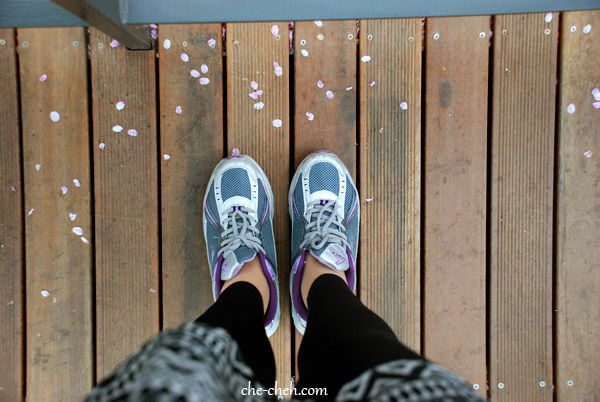 I think I write boring travel posts.